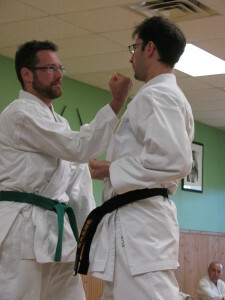 Back In The Gi » Blog Archive » Timeline of a karate grading. This is the story of a recent senior belt grading at our dojo. Bear in mind that every dojo’s gradings are different, and that they may emphasize different things or include different components. In fact, every grading within a dojo is different. 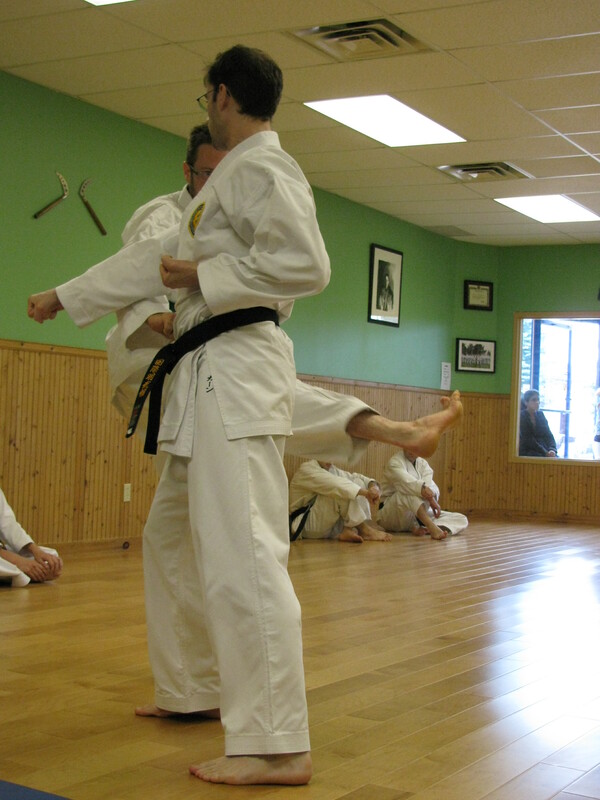 The point isn’t what the students are required to do at the grading, it’s that the experience represents a significant physical and mental and challenge that provides a major sense of accomplishment in earning the next promotion in rank. 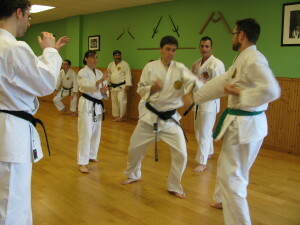 Here is what it was like for us at this particular grading. 9:45 AM — Breakfast. Shreddies and a protein bar. Coffee. Forecast for today is hot and humid. Packed several bottles of Gatorade and water, energy bars, and two gis. 10:20 AM — I arrive at the dojo and meet up with others who are grading, along with a few senior belts who aren’t grading today but have come early. 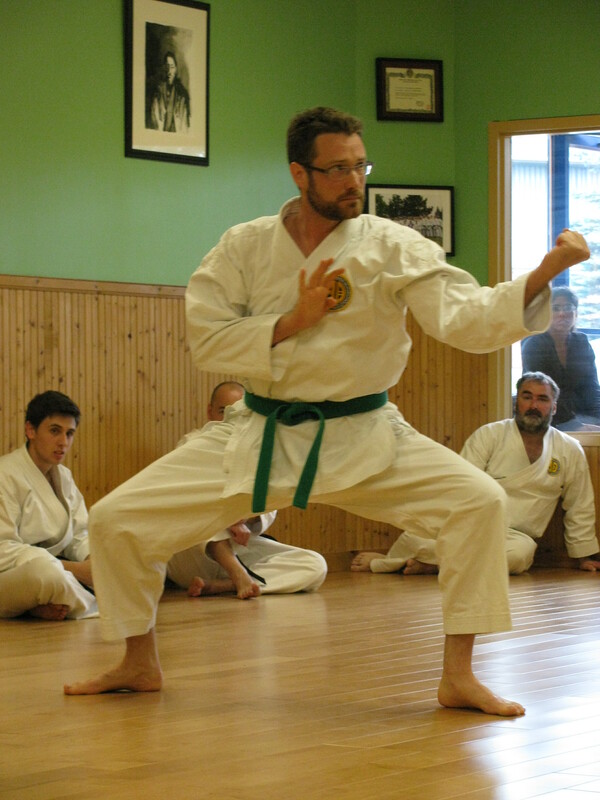 Each grading has a fitness component at the start, and we generally have a choice between a run or a series of exercises back at the dojo (for example, 150 pushups + 150 situps + 150 mountain climbers + 150 jumping jacks). Today I decide to do the run, so we get ourselves organized and head down to Riverside Park. 10:40 AM — At Riverside Park and ready to roll. 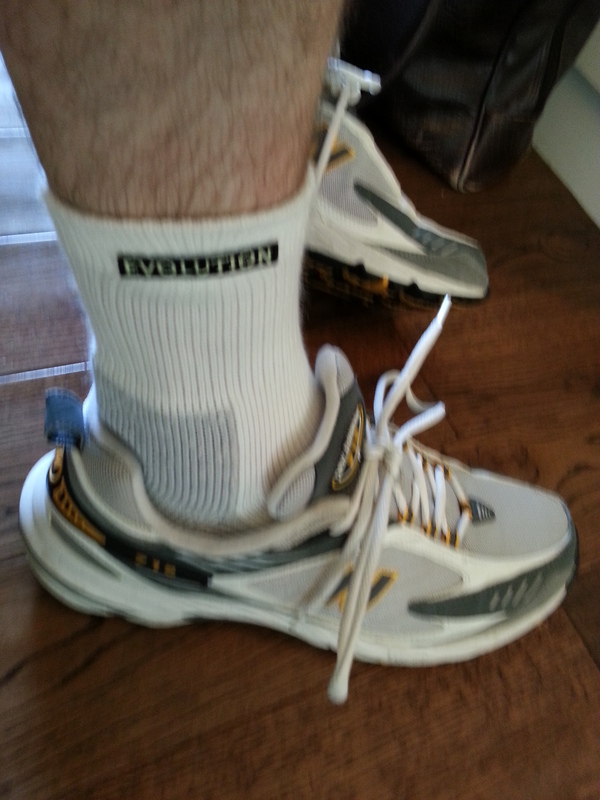 Time for a nice little 7km run through the trails at the park to get things started. And by “nice” and “little”, I mean “hot” and “gruelling”. Did I mention that it’s really hot out? 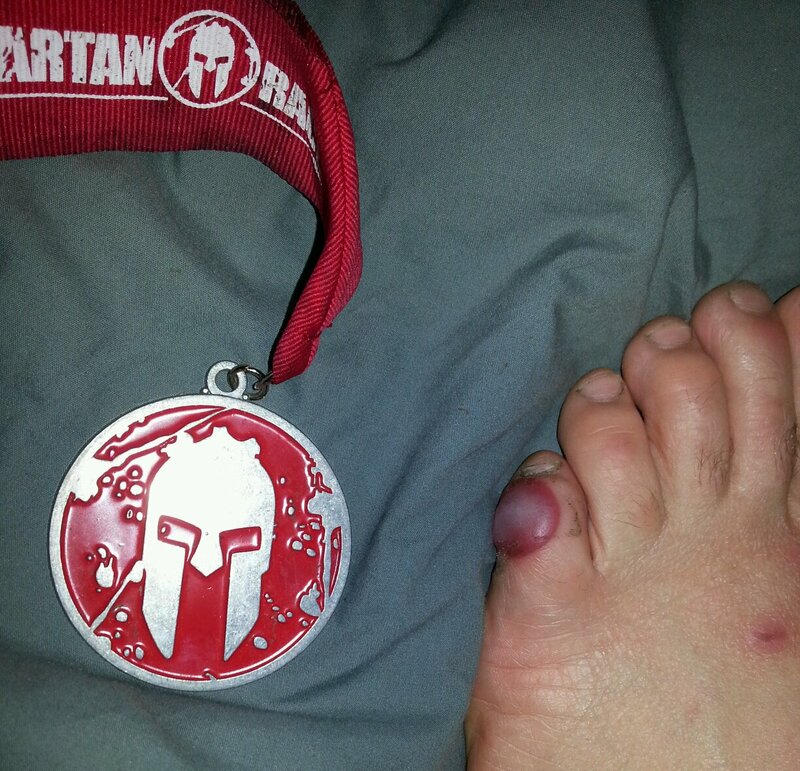 At least I have on proper running shoes, not like the ones I wore for the Spartan Race which gave me a nasty blister. I also remembered to wear some sports socks, which happened to be ones I got from the publishers of the scientific journal Evolution at a conference last summer. 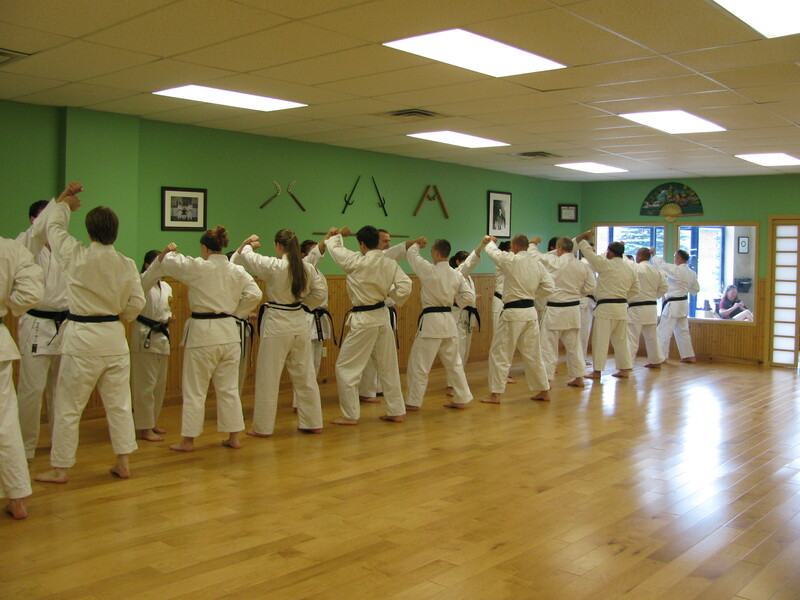 11:45 AM — We arrive back at the dojo, which is now filling up with black belts from our dojo and Senseis and students from five other cities. We change out of our sweaty running clothes and into our gis. People are milling about, stretching, chatting. 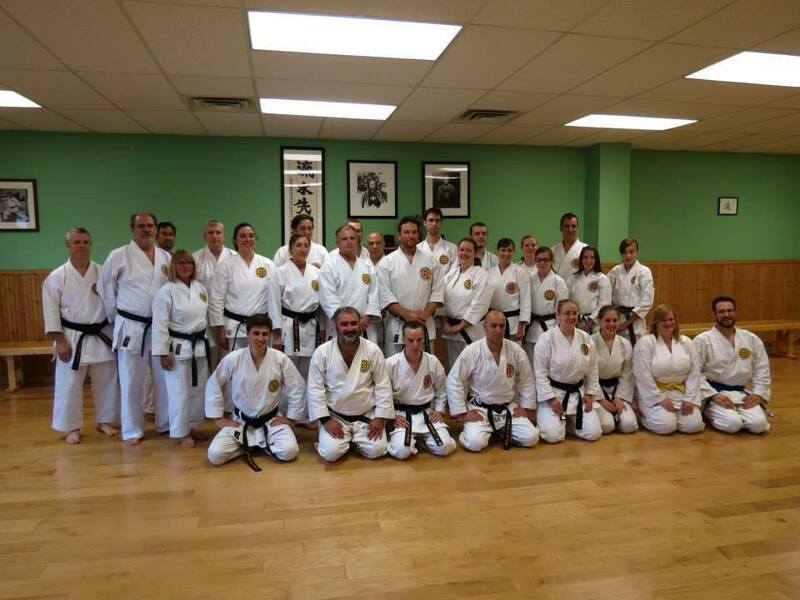 There are obviously some nerves among those grading, but the mood is positive and people are happy to see friends from other dojos. 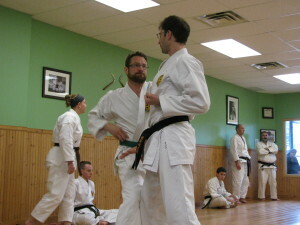 I realize that I am the only person below the rank of brown belt grading today. There is someone grading for Yondan, someone for Sandan, two for Nidan, two for Shodan, and one for black stripe. 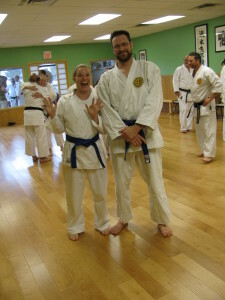 And me (grading for blue). 12:00 PM — Everyone lines up. We hear a welcome message from Sensei, followed by a formal bow-in. 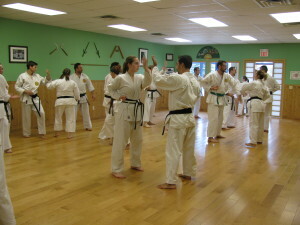 We start off with walking basics, then walking basics with partners. 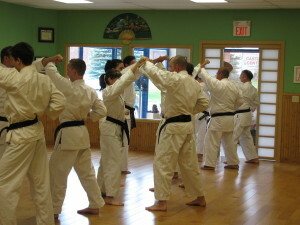 After the basics, we do some kakete and koteketae with a partner. 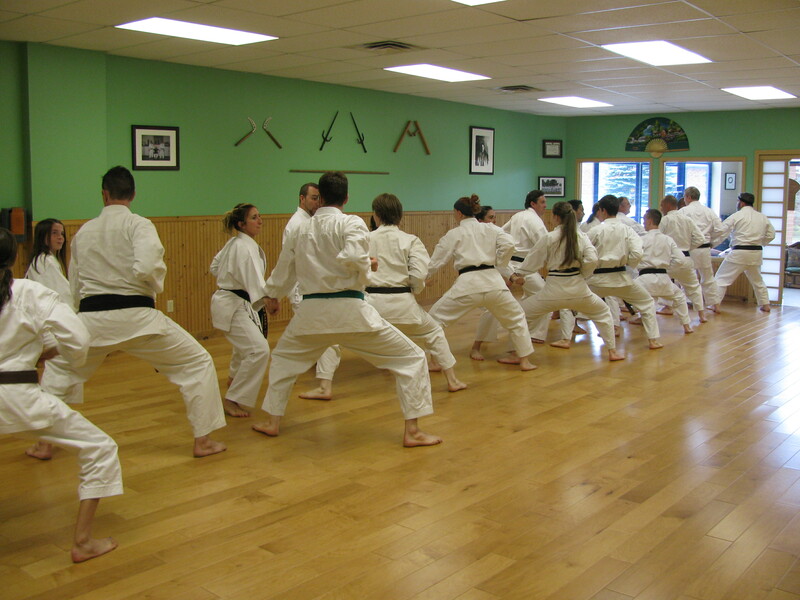 It is extremely hot in the dojo, and almost everyone is already sweating heavily. Eventually, Sensei turns on the air conditioning to provide a bit of relief (and, presumably, to prevent anyone from passing out). 12:30 PM — A short break for a drink. It’s very hot today, by the way. 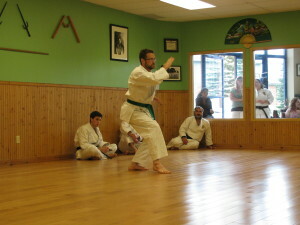 12:35 PM — Now it’s time for renzoku kumite. This is one of the most physically demanding parts of the grading, especially in the heat. I have to do 10 rounds, which is bad enough, but those grading for nidan have to do 25 rounds. 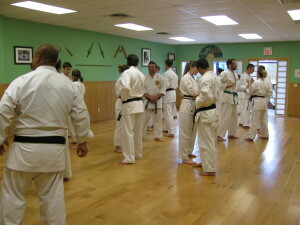 I finish and have a little time to catch my breath, but the nidan guys are still going. 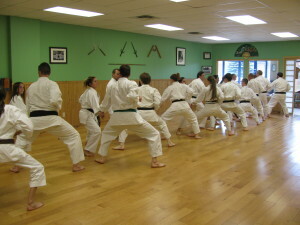 Here is an example of renzoku kumite. 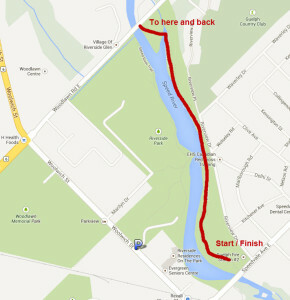 Note that this is only half a round, and it’s slower than some people tend to go. 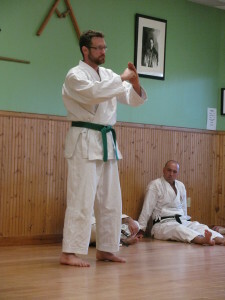 It’s also the simplest set of techniques, but we did any number of combinations. 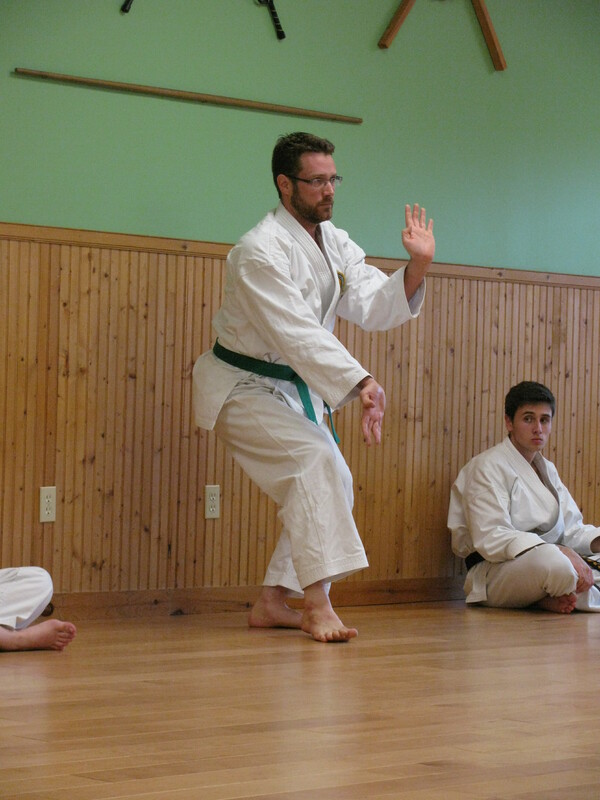 1:05 PM — I do my kakomi kumite. 6 rounds. The guys grading for nidan are still doing their renzoku. 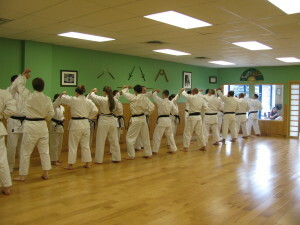 They don’t finish until 1:30 and then they have to do their kakomi. There’s a bit of waiting for me, since I got mine done first and had the fewest rounds to do. 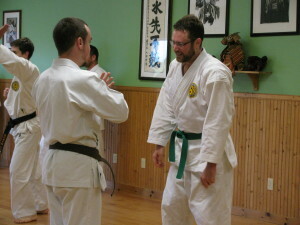 But then I join in for one of the people grading for nidan. 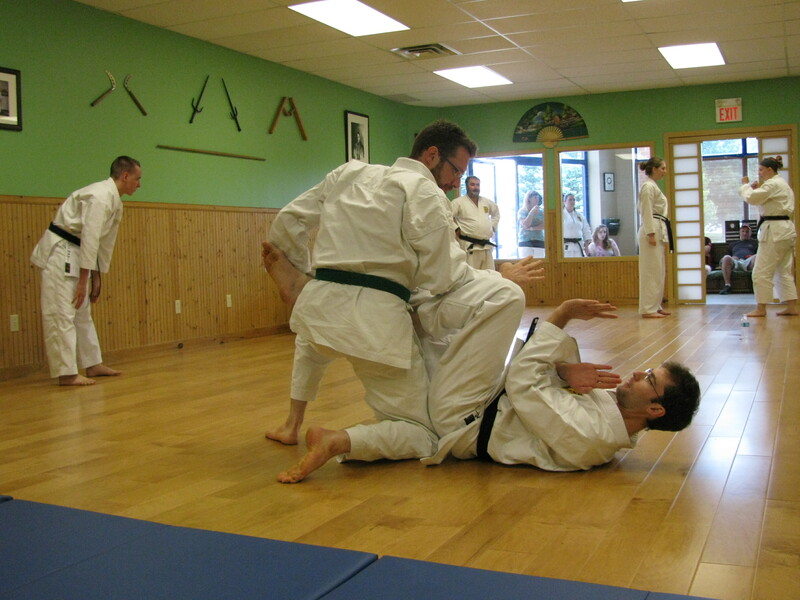 However, it’s much easier being on the outside of the circle than in the middle since you’re not blocking or striking the entire time. 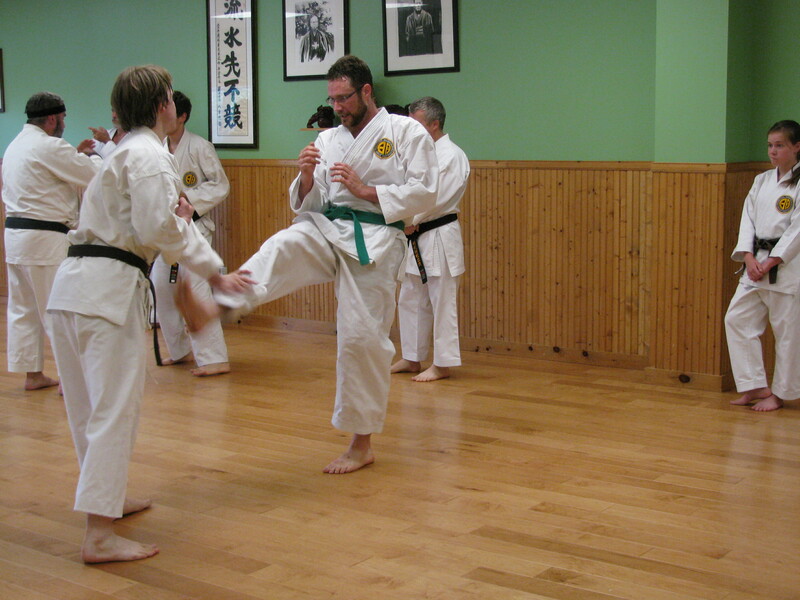 Here’s an example of kakomi kumite. 1:50 PM — Everyone finishes their kakomi. 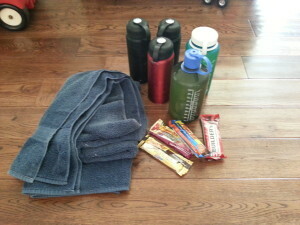 Time for another short break and a quick snack and lots of liquids. 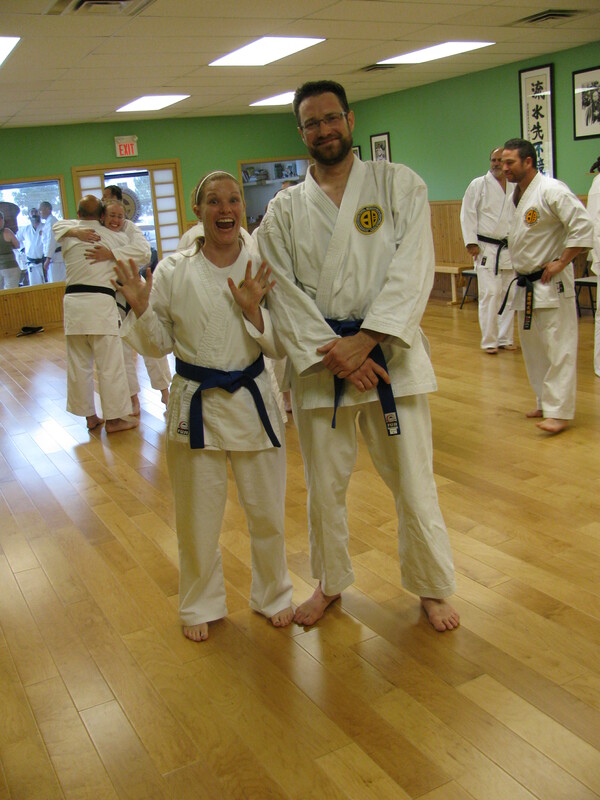 I also put on my clean gi. Bringing it was a great idea. 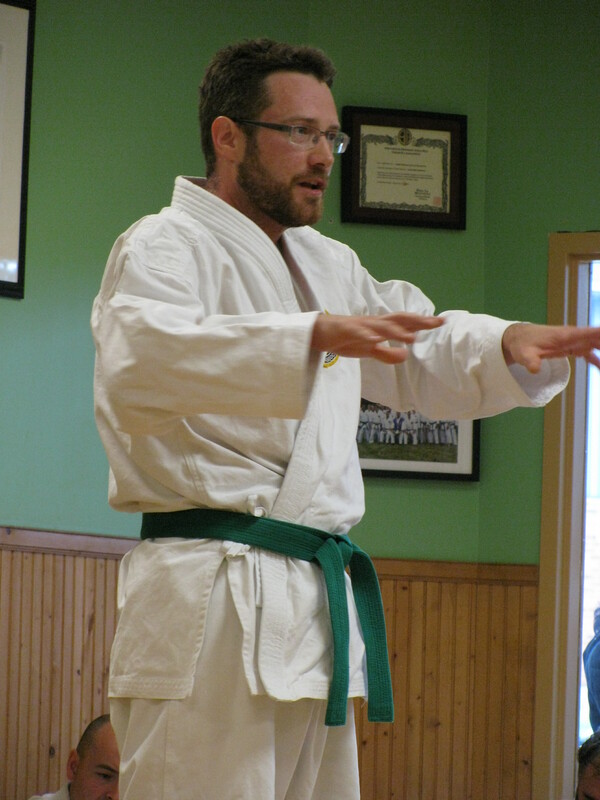 The air conditioning is humming now, and the sweat-soaked gi was feeling pretty gross by this point. This part of the grading is my least favourite and is the one that causes me more stress than anything else. 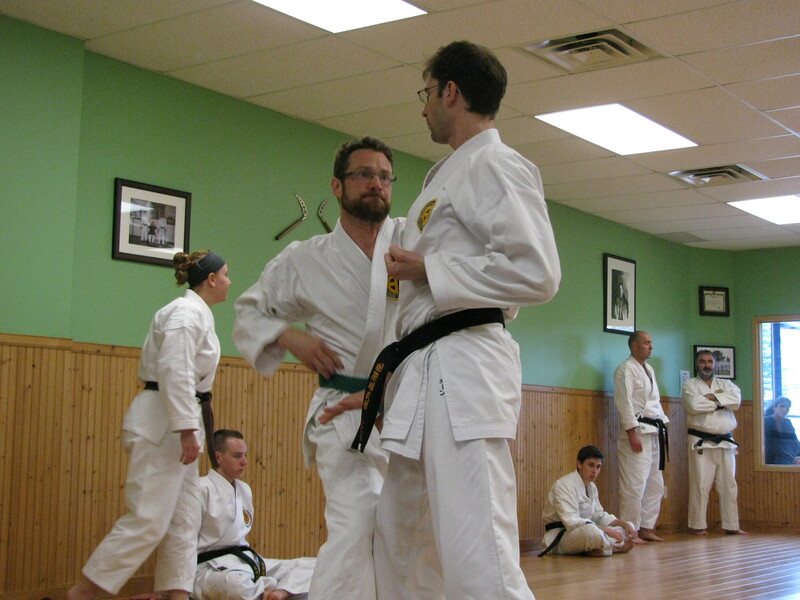 I’m not a fan of doing my katas under pressure and in front of an audience, with every move being scrutinized. The fact that we’re exhausted from the run and the first half of the grading doesn’t help. 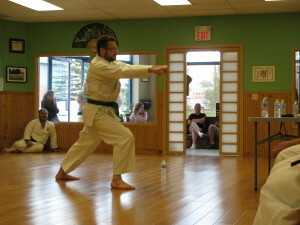 Plus, there’s a fair bit of sitting and waiting for our turn, because this part is done individually. This means that the muscles start to stiffen up, making kata performance even more difficult. 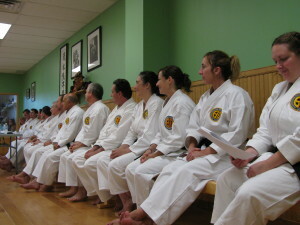 Several people go through their kata, bunkai, and oral questions. 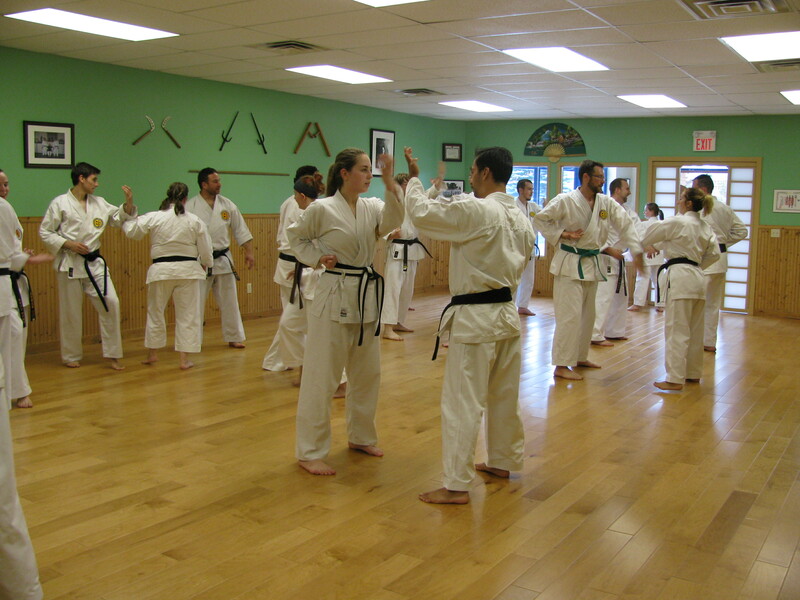 The black belts have been giving each person very good corrections and constructive criticisms on their katas. 3:25 PM — It’s been over an hour. 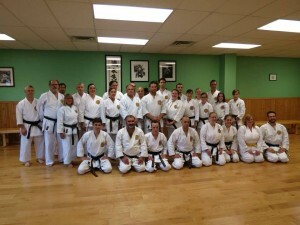 I still haven’t done my katas yet. 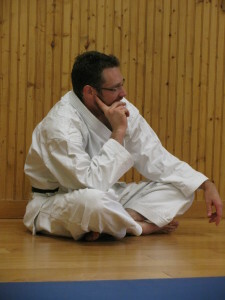 I’m getting rather stiff, so I’m grateful for a short break and chance to stretch. 3:30 PM — Back to finish the rest of the kata. I go dead last. I am asked to do two katas: Saifa and Seiryu. They go pretty well — meaning no major mistakes, not forgetting anything, or any of the various things that can go wrong in these situations. Obviously there are various comments for improvement, however. After my katas and the comments, it’s time for my oral question. Up to this point, many of the questions have been stuff like “What have you learned since you started karate?” or “What do you hope to accomplish in the future?”. Not for me. I get “Why do you think Chojun Miyagi created Goju-ryu?”. My answer, in true professorial manner, was somewhat complicated. I said that I don’t think he set out to create a style from scratch that would be part hard and part soft, but rather that it evolved that way more organically. 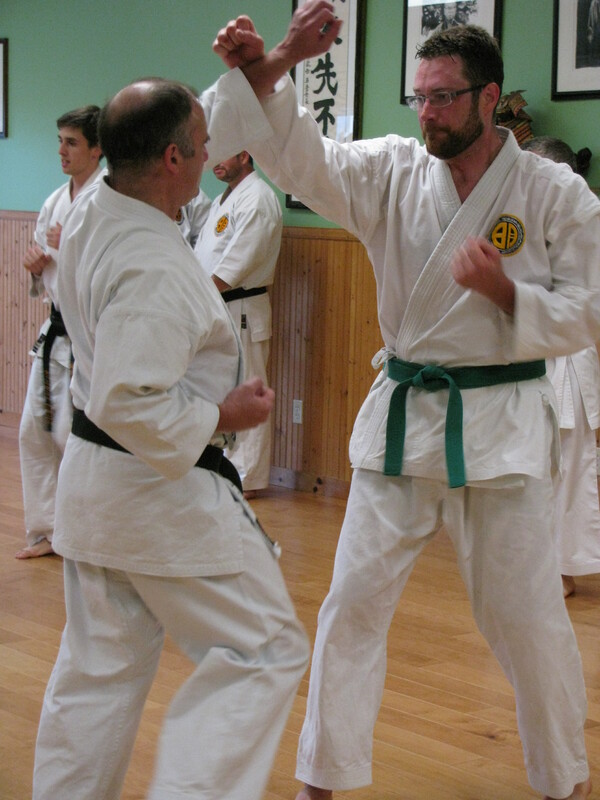 So, to me, the question actually had two components: one, why did his style end up being hard and soft, and two, why did he decide to name it Goju-ryu and emphasize this aspect of it? I talked a little about these, and then I was asked whether I had read a particular document by Miyagi and who the intended audience was. 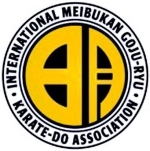 I believe the question was referring to this document, entitled “Historical Outline of Karate-Do, Martial Arts Of Ryukyu” — at least, that’s what I based my answer on. 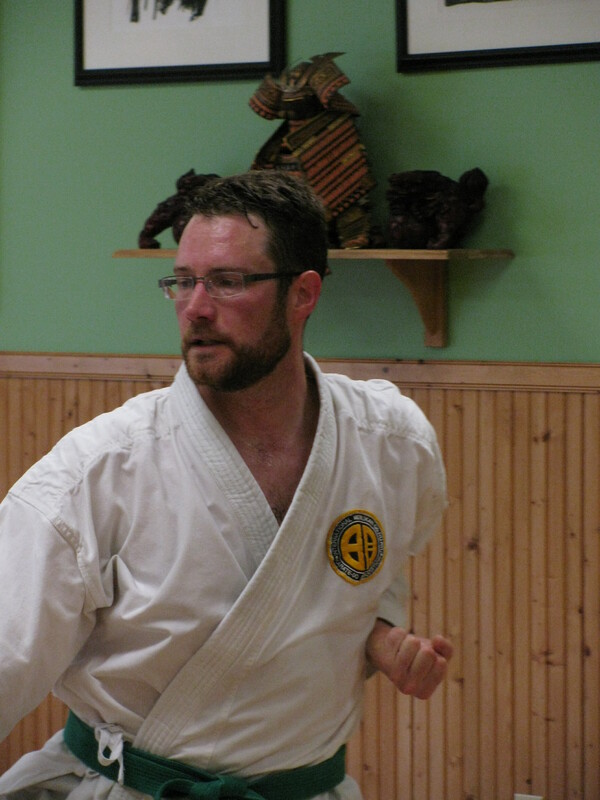 The last thing to do is my ippon kumite, with Sempai Wes as my partner. 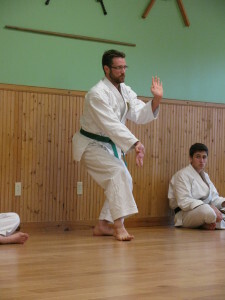 I only had to do the Jo and Chu ippons but the shodan candidates had to do all the ippons and nihons. 4:25 PM — The grading is essentially done. People are chatting or getting a drink while the judges discuss the results and fill out the certificates. 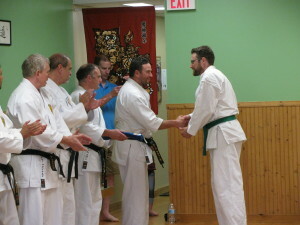 4:45 PM — The moment everyone has been waiting for: presentation of the new belts, shaking hands, bow-out, and group photo. It’s done! In case I forgot to mention, it was really hot today. I was wondering whether it was a hot day. It looks like it might have been hot.